It may rain: we've got a big tent. We may look like evangelicals proclaiming the word of God out in public: um, yes, that's the point. THIS THURSDAY, we celebrate our 5th birthday, the 5th year since God stirred The Crossing to life, and we want to say thank you: to Boston, to God, to the Cathedral and Diocese, to members past and present. There will be rocking worship, followed by a party and concert featuring bands connected to our ministry (don't miss Jamie Hart's band doing some life-affirming dance music, plus a foot-stomping gospel set). 3. GIVE a special birthday gift to The Crossing community. We're working to raise $10,000 in one night, and giving 10% away to justice efforts. READ THE REST OF THIS WEEK'S LIFE @ THE CROSSING BLAST HERE. This fall has turned into a season to witness to God’s love. This past weekend, people all over Boston and all over the world prayed and marked 10 years since the terror and heart-rending sadness of 9/11, and we wondered aloud how to bring reconciliation and peace to this hurting world. This coming weekend, thousands will gather in New York City to occupy Wall Street and demand an end to the unchecked rule of greed and might. A local group of Protest Chaplains -- many of them from The Crossing -- will head to the city bearing prayer, hope and the dream of God’s justice among the protesters. 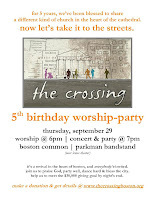 On Thursday, September 29, we’ll step out to Boston Common to celebrate The Crossing’s 5th anniversary with a Birthday Worship Party. 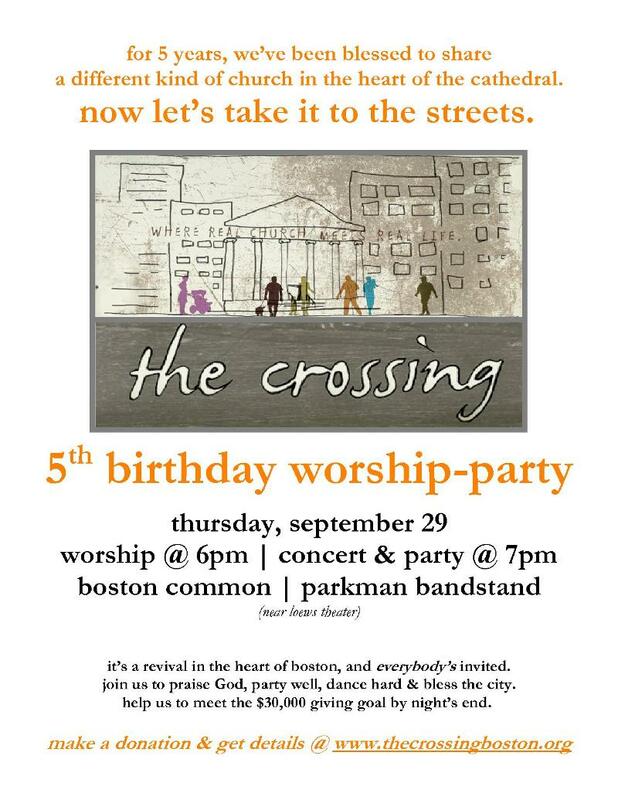 It will be less a celebration of ourselves, and more a chance to step out, give thanks and bless the city with music, prayer, communion and real live food (I can’t wait to pass out brownies and lemonade on the corner of Boylston and Tremont Streets). We’re dreaming of a tent revival like The Common hasn’t ever seen. Come celebrate God’s love out in the open. Progressive Christians don’t often go public with our witness. By the end of September, we’ll have enough practice to put the lie to that old story. Let’s be a different kind of Christian, world-changing Christians, starting now. Read lots more in this week's Life @ The Crossing blast here.